8” x 10.5”, 340 pp., color illus., hc. I’ve used the Deviant Moon Tarot deck, both with and without borders, for the better part of seven years. When it first came out I had questions about some of the minutiae in the imagery. So I corresponded with Patrick Valenza. I was surprised with his willingness to share portions of the story with me and fascinated with what he shared with me. Those early conversations with Patrick revealed that this was not a deck rushed to market like so many other decks these days, and I was left wanting to know more about how the drawings matured. Then I began to hear rumors about a book. On Christmas Eve, the postman dropped off a package. Upon opening it my first thought was, “When US Games Systems does something, they do it right”. It is a stunning book. It’s beautiful. The hardback full-color embossed cover, the weight of the paper – it is a four pound, three hundred forty page adventure for your eyes and mind. This is the new standard in tarot companion books, and like the deck, it was not rushed to market. You can tell that it was created with love. This is not just a book that’s about a deck. It is a book that demonstrates the evolution of the Art and the Artist, and it takes us on that evolutionary journey. This is a book for art students and artists who will appreciate and grow from the shared journey. This is a book for people who would like to understand the dark and the fantastic. This is a book for people who love the Deviant Moon Tarot, want to see what’s behind the curtain, and have the rest of the story revealed. Patrick joyfully recounts his creation process, and how his organic and narrative approach to art is the result of thirty years development. He shows us his edits, the images rejected, and entertains us with the stories of creation. Please don’t clear off a spot on your bookshelf for this book as it won’t be there collecting dust. Its beauty and the heirloom quality of its content will be appreciated time and time again when left out in the open to enjoy and inspire. Since its launch in 2008, the Deviant Moon has been one of the most talked-about decks of modern times, as fans endlessly pore over its haunting, marionette-like figures. What do the half-awake, half-dreaming faces mean? And what about the digital textures used throughout? Deviant Moon fans so far have had to rely on the small booklet supplied with the deck, supplemented by snippets from Patrick himself, who’s a warm and endlessly generous figure on social media. He has long indicated that the deck features details lifted from gravestones and abandoned buildings throughout Long Island and Brooklyn. Fans also know that Patrick was born with an unusually precocious artistic gift, and began preliminary work on the Deviant Moon as a young teenager – but it’s only with the publication of this book that we finally get the whole story. And what a book it is: weighing in at more than four pounds and nearly three years in the making, U.S. Games and Patrick have teamed up to create not an average tarot how-to, but a vast and sumptuous art book. It’s sheer size is the first thing that strikes you. This is not a book you’ll slip into a small bag: it’s hefty. But once you’ve got over that, you delve in and immediately realise that size isn’t the only thing that’s supersized here: everything about this book is turned up to 11, to quote from the immortal This is Spinal Tap. Every card in the deck is rendered in rich colour at full-page size, which in itself is an incredible treat for Deviant Moon fans. The cards aren’t small by any means, but the sheer amount of detail they contain means that sometimes, seeing them bigger really is better. Just exploring the images at such a size, and so beautifully printed, is a wonder. But what really gives this book depth, authenticity and meaning, is the backstory Patrick shares with us. It turns out that you can’t tell the story of the Deviant Moon without telling the life of Patrick Valenza, and vice versa. The two are irrevocably intertwined, and so to understand the deck’s genesis, we also need to see some of Patrick’s earliest childhood art, charting its development into the genius we see today. As well as childhood art, the book also reveals unseen character sketches, alternative card ideas that didn’t make the cut, and of course, the buildings and gravestones whose images and textures pepper the deck. As you’d expect, both upright and reversed meanings are given for each card, but there’s so much more. In addition, you might learn about how an image was inspired by a childhood dream, how a card was assembled from images of pieces of metal, how Major Arcana figures can be found in childhood form in the Minors and of course, learn about the legendary chess set Patrick created just for the Ten of Pentacles. If you’re a confirmed Deviant Moon fan, you might think you already know a lot about this deck, but trust me – there’s far, far more to learn. If the deck is totally new to you, then investing in this book, along with a set of the cards, will see you on a journey of discovery that’s bound to bring you delight for years to come. It’s so much more than ‘just’ a book: this is a tangible labour of love into which the author has poured his heart and soul, not to mention decades of work. For its part, U.S. Games has done a fantastic job as publisher in backing Patrick’s creative vision and by justifying every penny you’ll spend on this book. It might be more than a tad unwieldy, but this is every inch a luxury, heirloom publication, from the crackle-glaze cover to the brilliant, fake-advert endpapers and above all, the quality of the paper stock and the printing. Every character from the Deviant Moon comes alive with colour and as a fan you can spend hours absorbed, not just in the book, but in the brilliantly-realised esoteric universe Patrick has created. The saying goes that good things come to those who wait – and this is so much more than a good thing. It’s a unique, beautiful and important thing, epitomising what can be achieved when a creative genius with a truly unique idea is given the time and space to express that idea by a supportive publisher. There is something about a book that is magical and timeless. Its ability to transport us to different times and places, or into the mind perspective and imagination of another person is nothing short of miraculous. And yet still, there are some books that are further set apart from the others by their dazzling, memorable magic and unforgettable journeys. The Deviant Moon Tarot is an absolutely decadent dessert full of succulently sinful wonders. And for all its richness, it won't make your waist any thicker, though it will brighten dark corners of your day and satiate your appetite for more. If you have fallen in love with the Deviant Moon Tarot, the book about the deck is an absolute must-have that will add much insight to the details in your deck. The cover has an embossed glossy sheen and a slightly raised texture when one's fingers are brushed across its cover. You will be tempted to massage the cover as I was. When you move the book in the light, moonlight dances across the raised embossing and shards of light glint off the gold and silver embellishments. The inside covers of this book features an aged, rustic newsprint-look. Several hilarious spoofs of advertisements feature Valenza's curious crew of caricatures. The paper quality of this book's pages is exquisite, smooth like cream, with a rich, clear sheen to the ink. The pages are not pure white, but instead have a faint digital texture that resembles parchment paper. This is a high quality book through and through. 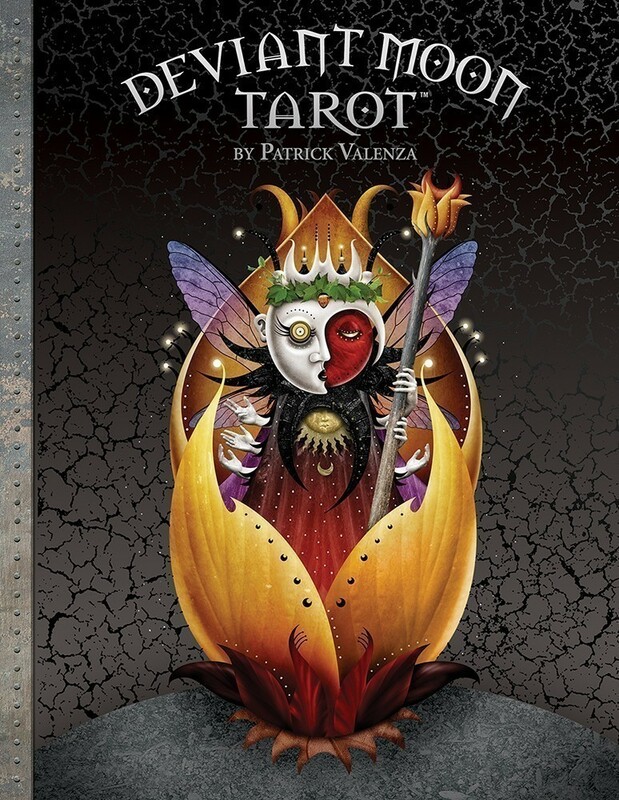 This book's content is centered around Valenza's actual creation of the Deviant Moon Tarot deck, how it was created and how to read it. You'll enter the mind of the author and go on a wild ride of beings that reside on the side of dreams. Valenza's well-loved tarot deck is one of the most popular modern decks available today. Through this book, you'll learn about the birth of the unique characters in the deck, many by happy accidents and others through very conscious shifting of designs. He also describes pieces and items found within the cards that add to meanings. I was surprised to learn that he would often craft clay items of things found in his deck to assist in his drawing process, and photographs of these crafts are included. The book explains in delightful detail how each card image was inspired, and this is where I found the true magic unfold. Many of the images originated when Valenza was just a boy and he includes photographic images of his original childhood sketches along with images of the structures that created the textures he used in the cards. Valenza includes a generous section for every card about both upright as well as reversed meanings. Readers will find the depth of this information invaluable to their readings. The Major and Minor Arcana cards are treated with equal weight with the generous portions of information provided. Want more? Every card explanation is accompanied by a gorgeous, large, full-page and full-color image of each card in the deck, larger than life and with astounding color, textures and details. You'll see things in this book that didn't make it into the deck: a peek backstage! These gorgeous images surpass even the beauty of the images in his deck because with the increased size is increased clarity and detail. This book would make a wonderful gift (even to oneself!) and it makes a strikingly proud and intriguing display on a coffee table. It can be read in long bouts of book binges, or in short spurts of daily breaks. I read it behaving much like I do when I'm starved for a good meal and I can't decide whether to wolf it down as fast as possible or to enjoy every delectable microsecond of its delicacy in slow motion. I was constantly torn between the impulse to binge and the realization that there were thousands of textures, tastes and details to focus on...my heart definitely started to beat faster with great glee as I turned the pages.